Bluetooth speakers have come a long way and have become an integral part of our life. Not only this, with each new launch, the sound quality has also improved. There is no longer a need to have those bulky sound systems to experience a good audio quality. These tiny devices are sufficient enough and are even light on the pocket. Fugoo the name may sound funny and can make you skeptical about the device. But believe me it is the best lightweight, high quality Bluetooth speaker that you can carry everywhere. Whether you want to walk in the rain, go for a desert safari or enjoy snowfall you can take it with you. It is waterproof, mudproof, shockproof and snow proof, and comes with impressive battery life of 40 hours. It has six registered, custom-designed audio drivers, with an 8-degree upward tilt for better surround sound. Also, the Bluetooth 4.0 gives a wireless connectivity of up to 33 feet and it weighs over one pound making it convenient to carry. You can buy this speaker for less than $200. Logitech Boom 2 Ultimate Ears is another big competitor in the race of best Bluetooth speaker. It gives 360-degree immersive sound that rejuvenates the place or any adventure. Plus, the waterproof feature, tough and attractive look adds up to the speaker. You can play it with Siri, Google, can use app to add features like block part and others. To play or pause a song tap the top of Boom 2 and to skip a song tap twice. It has a battery for up to 15 hours and can be paired with up to 8 Bluetooth enabled devices. It has all the features that you would want in a Bluetooth speaker, it is like having the future of Bluetooth device in your hand. This speaker sells for $199.99. An ultimate 360 degree Bluetooth speaker that spreads sound in all directions. Its compact size, flexible handle makes it easy to carry. The dual passive radiators and omnidirectional deflector gives you lifelike sound experience. Plus, it works in rains as well, and is bump free due to its soft material. With a battery life of up to 16 hours it weighs 0.9 kg. The boost connect app makes it easy to connect and switch between Bluetooth devices. If you don’t have your phone handy and want to make reservations press and hold the multi-function button to voice input Siri or Google. Sold at a price of $299.95. It might look small but its sound quality is crisp, clean and loud. With a solid battery life of up to 9 hours, ROLL 2 plays music up to 30m wireless range and can be immersed in liquid up to 1m for 30 minutes. It weighs 330 g and comes with 2-year hardware warranty. Also, it comes with a floatie that helps your ROLL 2 to float right beside you. Sold at a price of € 99,99. Braven BRV-1 portable Bluetooth speaker that combines flexibility and premium audio in compressed, sturdy package. It is completely waterproof and has a shockproof exterior made of durable plastic that covers all ports. A perfect device for outdoors that comes with 12 hours of playtime is priced at $99.99. Nyne Bass the Bluetooth speaker is for all, from explorers to musicians everyone likes it. It has a smooth and stylish design that makes it appealing. Comes in variety of designs, sizes and colors perfect for any kind of lifestyle. 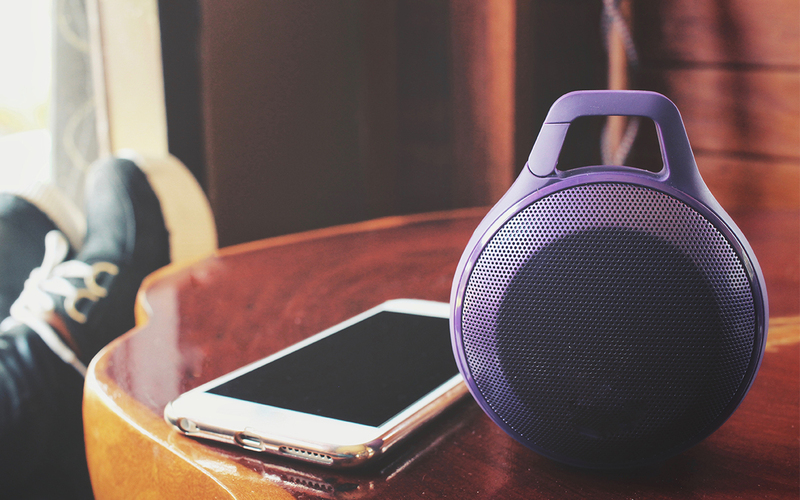 A waterproof speaker with, perfect for all to add a soundtrack to the life on the go. It has a microphone to assist and you can use it as a speakerphone for smartphone calls. The only drawback is that the battery offers only 10 hours of playtime and it is priced at $129.95. First portable speaker for musicians that combines power with remarkable audio quality and amazing bass. A Bluetooth speaker that offers full power, cleaner sound, deep bass and stereo image for your studio monitors. Attach your guitar or mic into the speaker and add custom made audio. With 40 watts of music power it is twice as much as a speaker of same size, battery life of 10 hours normal usage and auto standby. Perfect for music creation priced at $249.99. An all-round powerful option for portable, wireless speaker, 5 drivers with a built-in subwoofer. It gives roaring sound even at a small size and is a remarkable piece of innovation created with all the latest technology in it. It features 2 high performance amplifiers and 5 drivers. You can connect multiple devices as it is compatible with many multimedia devices. A perfect addition to your digital routine. You can find this speaker for as low as $129.99. All right we understand you are now looking for an ultra-compact Bluetooth speaker. JBL Clip is the right choice as it is the high-performance audio device that delivers music loud and clear as needed. Using it you can make a phone call or stream music wirelessly. It weighs 0.158 kg, easy to clip it on your bag and get in charge of audio at any place anytime. It comes with 5 hours of battery life and can be plugged into mobile devices, too, priced at $44.95. Jawbone brings another great speaker that fills large spaces with clear audio at any volume. It comes with live audio playback technology that produces three-dimensional sound and dual passive bass radiators add up to the sound quality. Using the 3.5 mm stereo you can connect it with multiple devices and built in microphone helps to make calls. The battery lasts up to 15 hours when fully charged priced at $299.99. This list will help you choose the right device for you. Whether you are looking for a compact device or for a robust one, we have tried to cover them all. You won’t regret choosing any of the device, as all have the essential features that one wants in a Bluetooth speaker. Fuggo Sport looks amazing, JBL clip is small and rounded, Soundlink comes with a handle making it easy to handle. Each device has their plus points that makes them stand apart. It’s up to you with which device you want to go with.